Super Falcons midfielder, Rita Chikwelu insists the team is ready for the task ahead in the Africa Women Cup of Nations, AWCON. Speaking at the pre-match presser, on Saturday, Chikwelu said the Falcons have trained well and are ready. “It is true that the Super Falcons is the most successful team in Africa but our secret is nothing more than hard work,” Chikwelu said. “We work hard even though we are champions. We work hard to defend our titles. “We have prepared very well and we hope we can keep winning. Our trainings are getting better and with God on our side, I think we can win against South Africa,” Chikwelu said. It will be another Nigeria v South Africa clash in one weekend as the Eagles were forced to a draw, 1-1 by the Bafana in an AFCON qualifier. 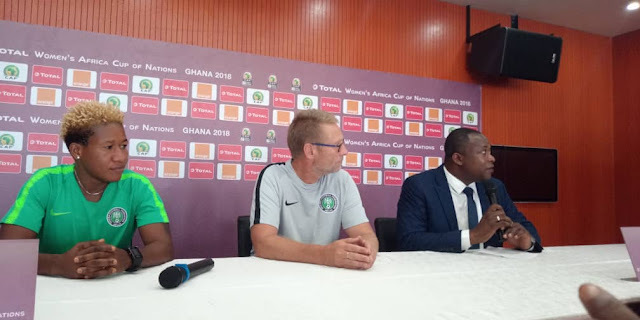 Thomas Dennerby, coach of the Falcons reveals that his mission is first to qualify for the World Cup before winning the AWCON. “Our target is to first secure a World Cup ticket and then to win the tournament,” Dennerby said at the pre-match presser. “The coaching staff around the team also work in a positive way to see the team win. Our attitude is to win every game. If we are not lucky in the first game, we will go to the next game and start all over again,” Denerby said. Dennerby also adds that the inclusion of Equatorial Guinea into the mix has not affected the plans of the Falcons. “Equatorial Guinea’s addition has not affected our plans so much. They are no problem for us. “I am not so worried about them. I just feel a little bit sad for Kenya who have prepared a team but cannot come,” Dennerby said.